GAINESVILLE, Fla. – The No. 4 Arkansas Razorbacks look to continue their strong start to the conference season as it travels to face the No. 2 Florida Gators for a three-game series this weekend in Gainesville. Game one is set for a 5:30 p.m. start on Friday at Alfred A. McKethan Stadium and will be televised on SEC Network+. Games two and three between the Hogs and Gators will be in front of a national audience as ESPN2 will carry Saturday’s game and the SEC Network will carry Sunday’s game. Both of the final two games of the series will start at 11 a.m. CT. This weekend’s series is Arkansas’ second straight against a top-five opponent and first against the Gators since 2016. Arkansas did face Florida once in last year’s SEC Tournament semifinals, beating the eventual national champion in run-rule fashion, 16-0 in seven innings, for its fourth SEC Tournament final berth in school history. All three games will be available on the WatchESPN app this weekend. Mick Hubert (PxP) and Nick Belmonte (Analyst) will call the game for SEC Network+ on Friday. Tom Hart (PxP) and Kyle Peterson (Analyst) will have games two and three on ESPN2 and the SEC Network. As always, Arkansas’ Sportscaster of the Year Phil Elson will call all three games on the radio for the Razorback Sports Network from IMG. Those radio broadcasts are also available on the Razorback Gameday app. >> Arkansas heads into its series with No. 2 Florida as one of two SEC programs that are undefeated in conference play (Vanderbilt) going into week two. >> Over the last six games, Arkansas has hit 17 home runs, 13 of which came at the expense of No. 4 Kentucky last week. The Hogs currently lead the SEC and are second in the nation with 41 home runs. >> The Hogs are well ahead of last year’s home run pace where they hit an SEC-best 83 home runs, its third-most in school history. The 41 home runs hit this year is 12 ahead of the 2017 pace after 21 games. >> Freshman Heston Kjerstad hit two home runs in the loss to Charlotte on Wednesday. He’s the fifth different Razorback to record a multi-home run game this season (C. Shaddy, G. Koch, C. Martin, J. McFarland, H. Kjerstad). 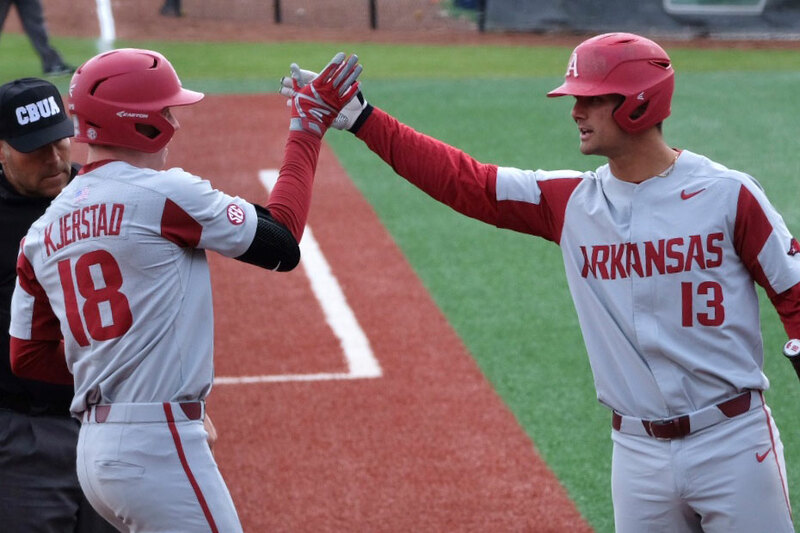 >> The Razorbacks have been magnificent over the first three innings this season scoring 77 of their 189 runs, making up 41 percent of their season run total. >> Freshman Casey Martin had his team-best 13-game hitting streak snapped on Wednesday at Charlotte. During that streak, he was hitting .367 with 11 RBIs, four home runs, 14 runs scored. >> The three-game sweep over No. 4 Kentucky last week was its first over the Wildcats since 2004. >> Arkansas scored 39 runs on Kentucky, its most in a three-game conference series since 1997. >> Junior Blaine Knight currently has the third-lowest ERA (1.30) of any SEC pitcher going into Friday’s game against the Gators. Four of his five outings have been five innings or more.